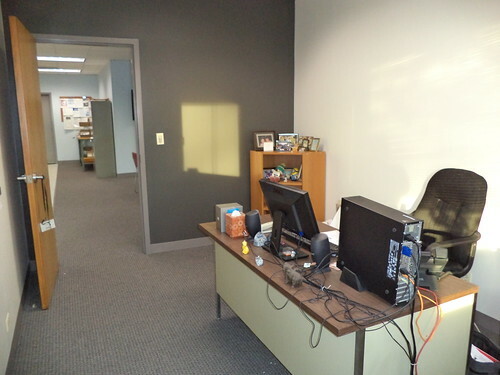 So, what does the office look like now, right now. Well, looking east northeast, you have this view. There is a clock radio and an old lap top computer sitting on top of the bookshelf. I'm taking the clock radio home with me. I thought it would pick up my jazz station but it doesn't. We are very close to the transmission tower for WBBM radio but that shouldn't matter with the signal. It's all staticy. I have several bags of give away stuff to which I'll add it. The framed photo is from our first trip to Walt Disney World back in 1990. It's of a sign we saw in what used to be MGM-Hollywood. We were in line to see the Muppet Babies show. It says, "You are neither here nor there". So many days feel like that. I have photo albums from old jobs on the second shelf. The third shelf has a clipboard and yellow legal pads for when I go into the field, as well as a dictionary. The bottom shelf has my work boots and my safety vests. That blue bag you see on the floor has a couple awards and a framed cross-stitch. Those were behind me in the old office and will go behind me here. I need to get more of those 3M picture hanging things which simply adhere to the wall. I use them at home and they are wonderful. I don't feel like putting holes in the new wall to hang my stuff. You can see how well the decal works. That's my aloe and geranium in the window. the sill is very wide and they would work to sit there forever, but I really want a decorative plant stand. I have an elephant-shaped watering can and I could put that on the bottom shelf of a plant stand. Right now, I take the geranium to the sink in the kitchen and drench it. I should put it in something other than the green plastic container it was in at the nursery. I'm not sure about stenciling something along the wall. I had thought of a row of small tiger hawks right under the sill. Then I though about flowers above the window. Right now, I like it plain. The yellow is bright and sunny and is such a mood elevator, even on these bitter cold or heavily overcast days. I like being able to look out and across for a good ways. The sun is in my eyes for about 15 minute in the morning now, but I don't mind. I didn't have much more than a parking lot view in the old office and I didn't put my desk where I could see out because that put my back to the door, which I did not like. This is looking west northwest. I love the dark gray. Black would have been way too dark. I got paint to paint the frame for the Fantasia poster and just need to get that done. 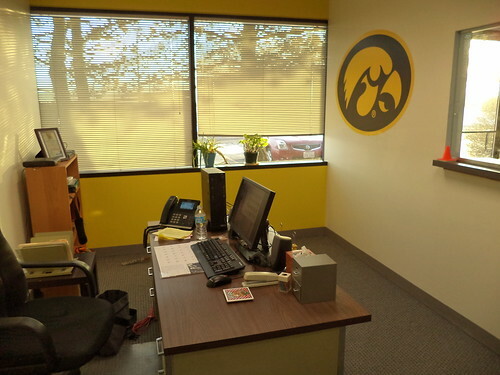 Once it's done, then I can bring the Hawkeye 12-0 season poster and Fantasia and figure out where to put them. I think I want the corner to be my picture area. I've got this huge ivory wall behind me, but I don't want to fill it completely with stuff. I have a panoramic photo of Chicago that I'm just not sure where to put. I need to get the posters up first and then I'll have a better feel for where to put the Chicago poster. Believe it or not, my office is the most personalized. Other people just don't seem to be into hanging stuff other than phone numbers on post its, on their walls. 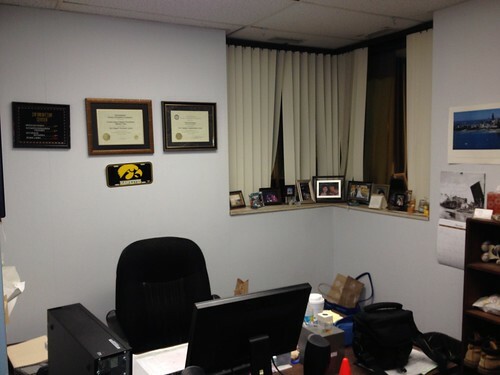 Gene is a new dad so he has photos of his daughter on a bookshelf in his office, but he has all this wall space and there's nothing on it. Maybe it's me in that I like to be surrounded by things that make me happy. You can see into the main office there, a bit. We had a long discussion about the color of that space. Mike had picked out a more muted blue; one that had more gray in it. I wasn't sure that was a good color and suggested the color we ultimately chose. It works perfectly. It's bright and inviting but not loud. We have a skylight in that main area and this blue works perfectly with the natural light. 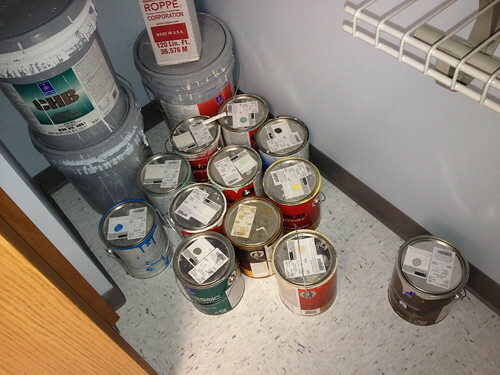 If you're looking for paint, well, they left us the unused gallons. (Those are the awards and the cross-stitch I have to put up.) to this. (Nancy, your design suggestion was perfect.) Yeah, I think this works. 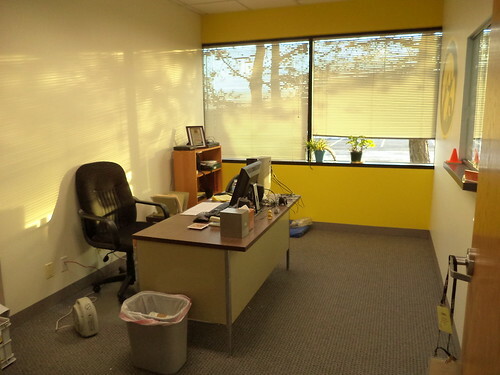 What a bright and happy office! I like the colours. It would be a calming place to work. I also love the decal!